Despite the known antipathy of the Air Ministry towards the monoplane as a fighter configuration, and its lack of success with the Wizard, Westland chose a low-wing monoplane design for its response to Specification F.20/27. An air-cooled radial engine and twin-gun armament were specified. From numerous proposals, the Air Ministry chose to order prototypes of two biplanes and two monoplanes, including that offered by Westland. First flown in August 1928 and known as the Interceptor, this was of metal construction and fabric covering except the forward fuselage, which had detachable metal panels. Two 7.7mm Vickers guns were installed low in the open cockpit and were totally enclosed behind a series of louvres along the line of the blast tubes. 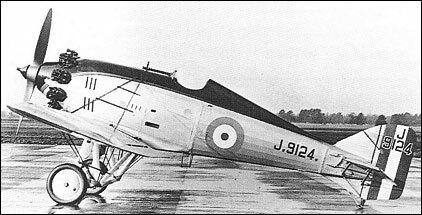 As first flown, the F.20/27 was powered by an uncowled 440hp Bristol Mercury IIA nine-cylinder air-cooled radial, but this was soon replaced by a 480hp Mercury IIIA and, eventually, a 420hp Bristol Jupiter VII, to which a Townend ring was later added. To overcome handling problems, successive modifications were introduced, including automatic wing slots on the wing roots, redesigned wing fillets and a modified, taller fin and rudder. Performance remained mediocre, however, and the Hawker biplane design to F.20/27 was chosen instead, evolving into the Fury. however, and the Hawker biplane design to F.20/27 was chosen instead, evolving into the Fury.